Summary: Guest blogger, Matt Hester, shows how to use Windows PowerShell and MDT to automate deployment of Windows. Microsoft Scripting Guy, Ed Wilson, is here. Today, guest blogger, Matt Hester, joins us to wrap up MDT Week. Deploying Windows 7 is a hot topic that most of you or your departments are currently tackling. Hopefully, you are familiar with the Microsoft Deployment Toolkit 2010 (MDT). If you are not, the MDT is a FREE tool that provides you with a framework to create custom images for deployment in your environment. The images can be for servers or client computers. The tool helps you put together all the necessary components (such as the operating system, applications, and drivers) into a standard image. Additionally, you can create task sequences to make sure your deployment is run in the proper order and correctly. Then MDT will put all the pieces together in a custom image that you can deploy in your infrastructure. The MDT images can be deployed via DVD, USB, a network share, or PXE boot—and the deployment can be physical or virtual. The secret sauce behind the MDT images is they are stored in the Windows Imaging (WIM) file format. WIM is designed to help deploy Windows technologies. The WIM file format is hardware agnostic, and unlike other imaging tools, you do not need a different image for each change in hardware. The only exception is that it is recommended you have a different image for 32-bit vs. 64-bit systems. You can learn more here: ImageX and WIM Image Format. What makes MDT even greater is the fact that it has built-in Windows PowerShell support. As you move through the MDT wizards, you will see the ever friendly View script button. This gives you a way to learn the syntax of the MDT. More importantly, by copying and saving the scripts, you can give yourself a quick and dirty backup to re-create your MDT environment if you need to. Although updating the Deployment Share is a simple Windows PowerShell command, it does preform a crucial task in the deployment process. Updating the Deployment Share is actually going to configure the Deployment Share with the boot environment. This environment contains all the common files and scripts to build your custom image. This process will also create two preinstallation (PE) WIM files (x86 and x64). The PE environment is the installation platform that will begin the installation process and allow your installation to access the Deployment Share for your applications, drivers, operating systems, and so on. Although the files that are created during the update share process are extremely portable, one of the advantages is combining the WIM files with the Windows Deployment Services (WDS). WDS is a built-in role for your servers running Windows Server 2008 R2. The main reason you will want to use WDS is the built in PXE support. This allows your servers to accept network boot requests to deploy your images. 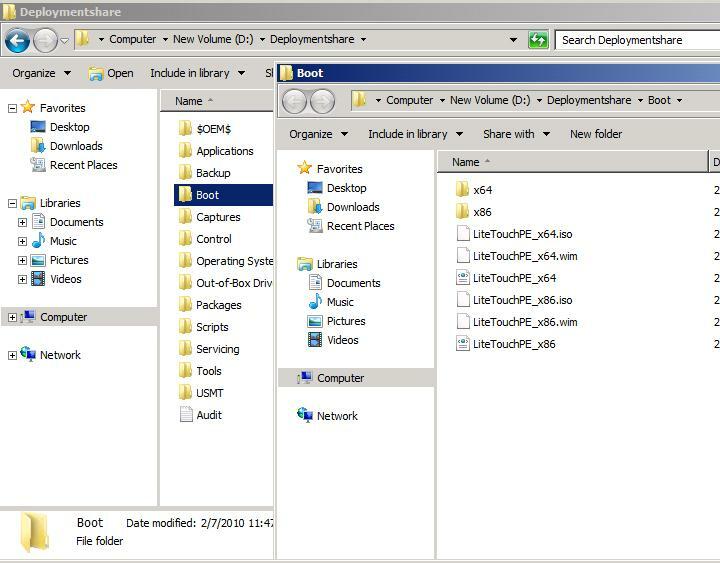 The MDT PE image can be placed in the WDS share so you can accept the PXE boot requests, allow access to the PE WIM file, and then access the remaining resources in the Deployment Share. Unfortunately, WDS does not support Windows PowerShell. However, WDS has a great command prompt tool called WDSUTIL. While WDSUTIL is a command prompt tool, it does wish it could be a Windows PowerShell tool, and it is has pseudo Windows PowerShell syntax. If you look at the following WDSUTIL command, you can see what I mean with the Add-Image switch. By-the-way, the following command adds the PE WIM file to the WDS server. This provides WDS with the ability to take PXE boot requests and access the files created in the MDT to deploy an image. As you can see, by using these free tools and Windows PowerShell scripts, you can quickly build and create your MDT environment. You can also take the power of the MDT and combine it with the WDS to have a lite-touch deployment platform. This allows you to quickly build and create a solid platform to deploy your corporate standard images in your environment. Thank you, Matt, for sharing your time and knowledge. Join us tomorrow for the first post of 2012. Happy New Year to you all.